The Periyar Wildlife Sanctuary in Thekkady is considered as one of the best wildlife parks in the country for spending a thrilling vacation, full of adventure, watching the wild animals as well as taking their snaps. The district of Thekkady is nearly on the border of with the state of Tamil Nadu, and is well joined by bus to both Kerala and Tamil Nadu. In the Periyar wildlife sanctuary , various species of wild animals can be observed like the Tiger, the Asiatic Wild Elephant, and the unique Nilgiri langur with an entirely black body and a white face. 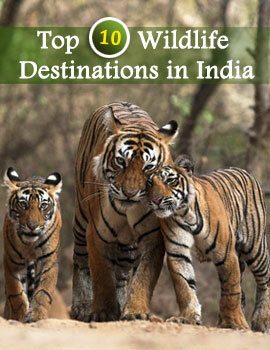 Some of the other animals found are the wild dog, bear, wild dog, leopards, bison, sambar, gaurs, lion tailed macaques etc. The special attraction of this place is the boat ride over the artificial Periyar lake of Thekkady. Apart from the lake cruises, the other attractions are the elephant rides and trips to the ruined Mangala Devi Temple, inside the Thekkady forest. The Periyar wildlife sanctuary spreads out across a vast area of 777 square kilometers. 360 square kilometers of the whole area is dense evergreen forest. The Periyar wildlife sanctuary in Thekkady is 190 kilometers from Cochin, 60 kilometers from Idukki and 114 kilometers from Kottayam. The district of Thekkady has a good number of hotels which provide a luxurious and comfortable stay. There are a number of First Class Resorts in Periyar/Thekkady, which offer all the sophistication of modern life with flawless service. The First Class Resorts in Periyar/Thekkady promise to provide the guests with all the amenities and advantages in the most lavish way, coupled with the traditional hospitality of Kerala. The First Class Resorts in Periyar are furnished carefully to all the needs of the guests. The First Class Resorts in Periyar/Thekkady are decorated with grace and style. The wildlife resorts in Periyar have a provision for good restaurants inside them, which serves a wide variety of delicious local, Continental and other Indian food items.